Folded color map in Spanish with some legends and a brief history also in English. Includes a state map (scale 1:800,000), Campeche (1:16,280), Ciuded del Carmen (1:20,160), Escarcega (1:21,625), Champoton (1:34,170), and Calkini (1:20,900). 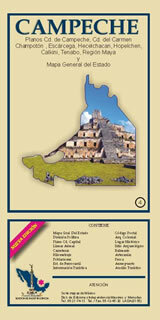 Also includes a Mayan region map, postal code information and two insets of archeological zones of Edzna and Calakmul.